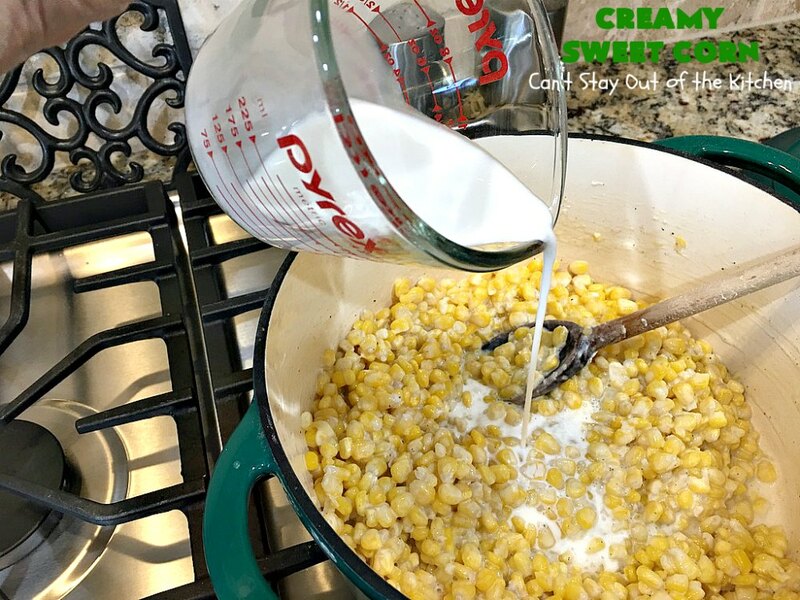 I think this Creamy Sweet Corn has become my favorite way to prepare corn! 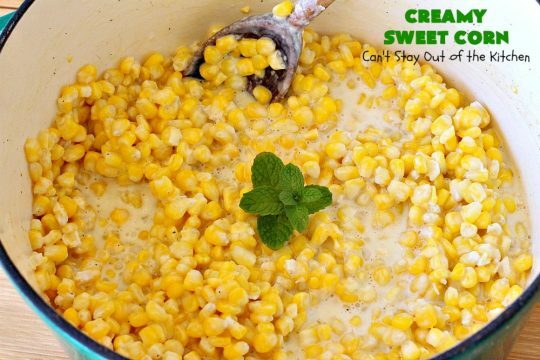 Anyway, this delicious sweet corn recipe is quick, easy and uses very few ingredients. It’s the perfect side dish when you’re in a hurry. 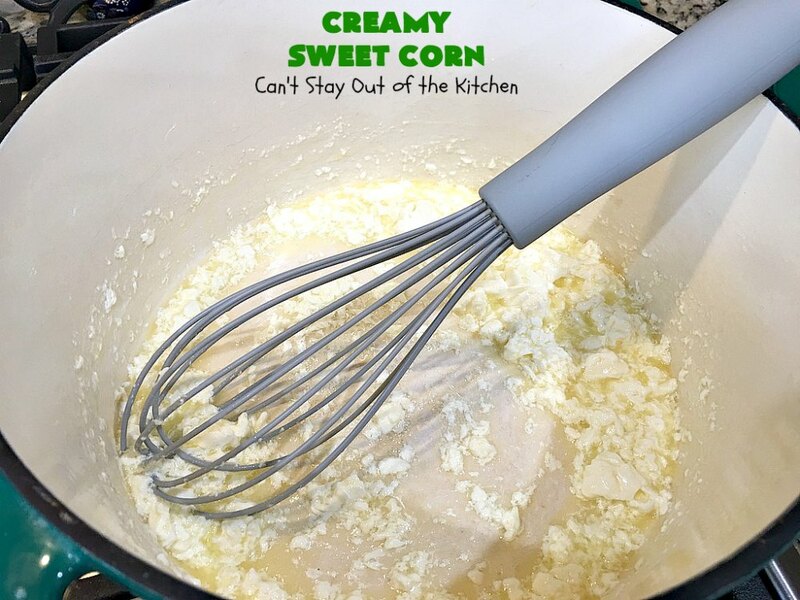 The main ingredients are frozen corn, cream cheese and heavy whipping cream. 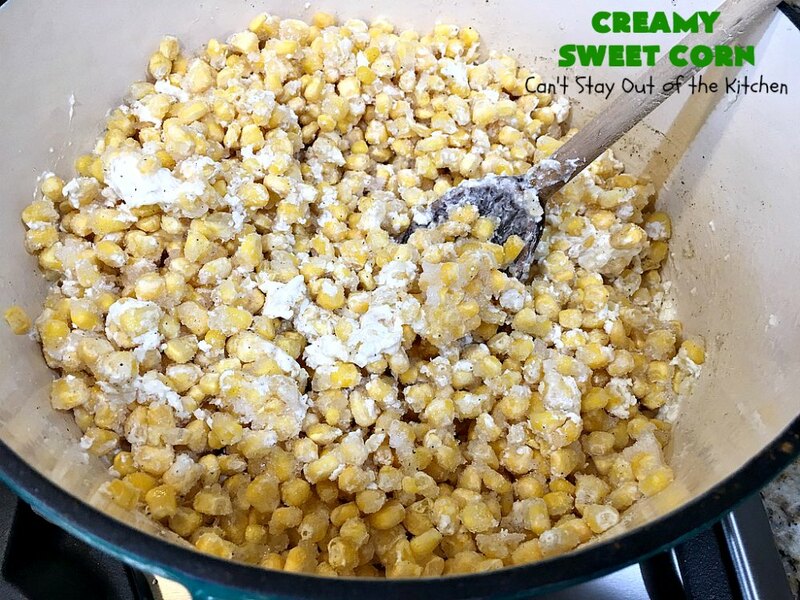 It is absolutely some of the best tasting sweet corn you’ll EVER eat! 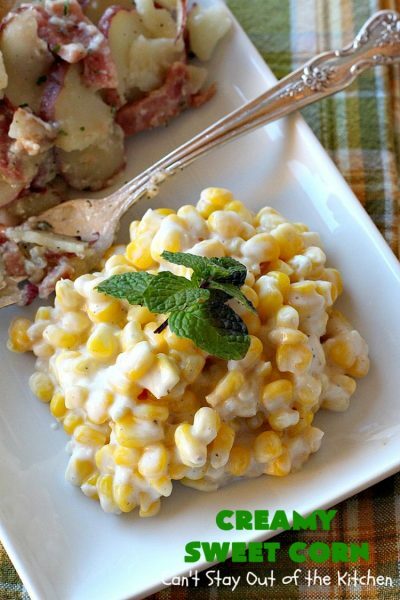 Every time we’ve served it, this corn dish gets rave reviews. 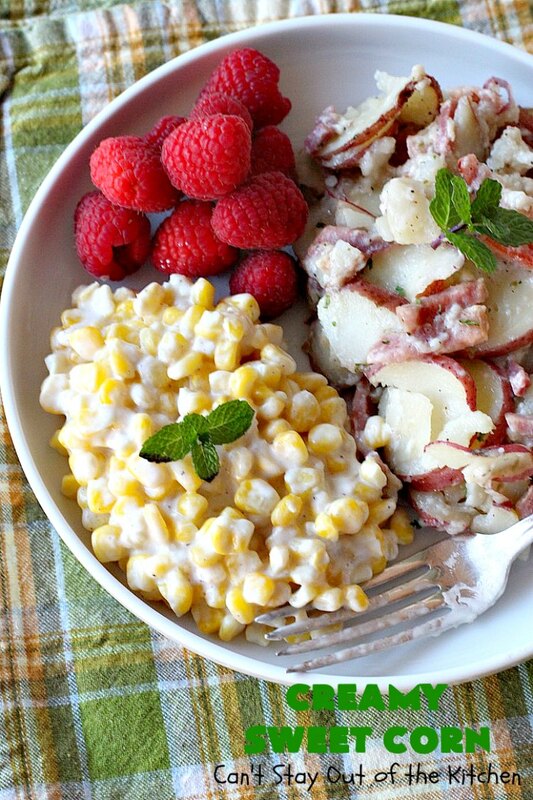 This amazing side dish tastes a lot like Rudy’s Cream Corn. If you’ve never been to Rudy’s BBQ in Texas, you don’t know what you’re missing! Their corn is legendary. This is the closest recipe to their corn I’ve ever tasted. We were not even trying to make a copycat recipe. 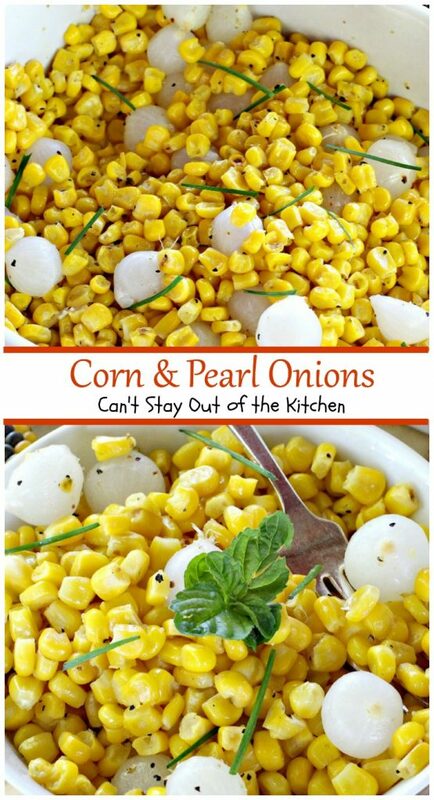 But this corn recipe reminded me so much of their corn that I thought I’d mention it. Seriously, you will want to lick the bowl, this corn is sooo good. I got this fantastic recipe from a neighbor a few streets away from us. I told Linda, her recipes are like hitting a gold mine. Every single one that I’ve tried has been absolutely drool-worthy. Many of her recipes are incredibly easy, too. I’ve made this recipe several times since the initial time described below. Every time I serve it for company, they rave over this corn. 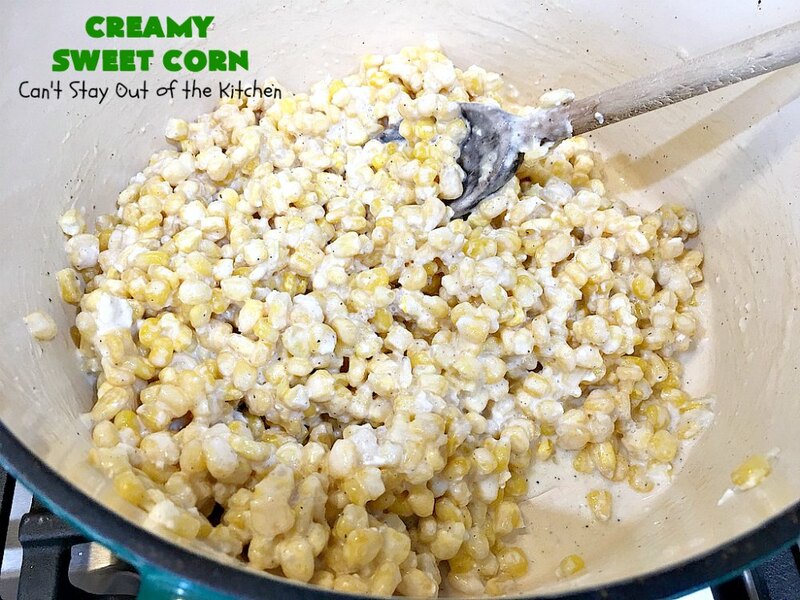 🙂 One of the things I like about this corn dish is it can be made in 10 minutes. Yep. I like simple and easy. The first time I made this, I served it with Creamy Scalloped Potatoes and Ham to our Friday night care group. Yes, it was a huge hit. Everyone had multiple helpings. I served this another time when we had our college kids over for lunch after church. They ate the whole batch until the pot was empty without a kernel left! I suppose next time I will have to make a double batch! I’ve used half-and-half (when that was all I had on hand) and heavy whipping cream. There’s not a huge difference between the two, but my personal preference is to make it with cream. 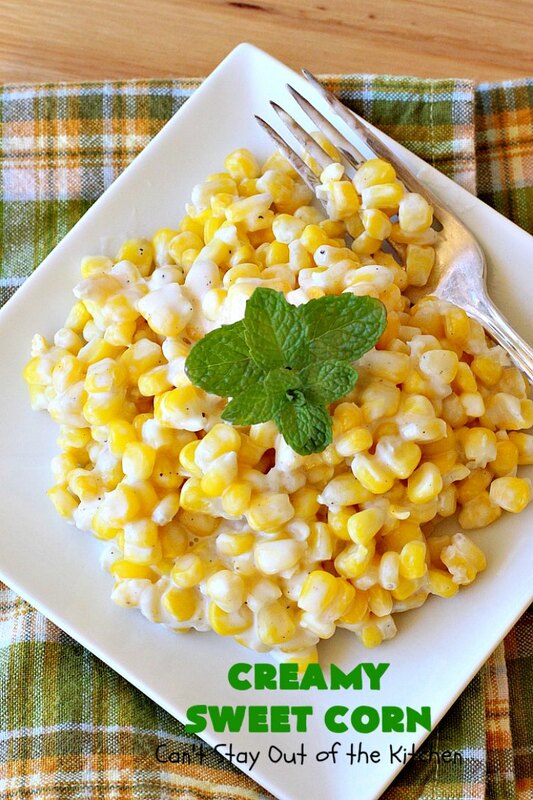 If you want a side dish to wow your family and friends, this spectacular Creamy Sweet Corn will do it. No one will believe it only took you 10 minutes to make this dish. Plus, it’s just so incredibly good. For those who need a gluten free recipe, this corn dish is naturally gluten free. It’s perfect for holiday or company meals. But, since it’s made in a jiffy, you’ll find this becoming your go-to corn dish, too! Creamy Sweet Corn is one of the best side dishes for corn you’ll ever eat! 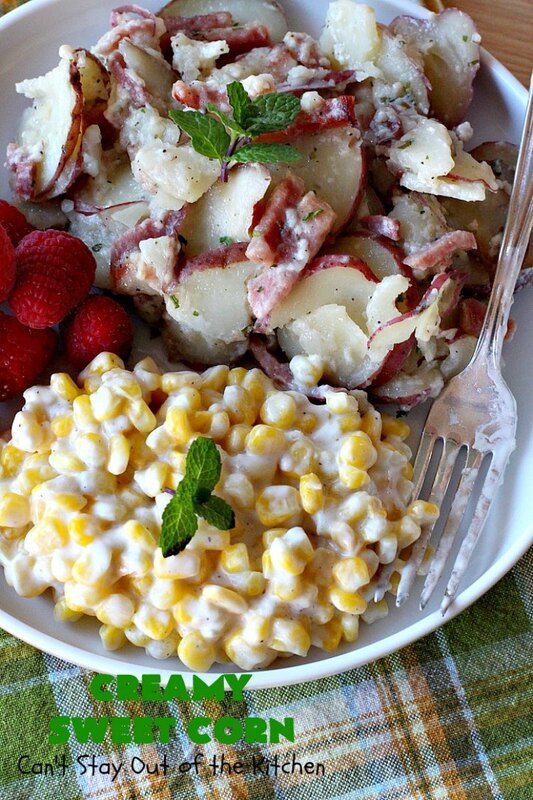 This amazing side dish can be whipped up in ten minutes! I served Creamy Sweet Corn with Creamy Scalloped Potatoes and Ham the first time I made it. 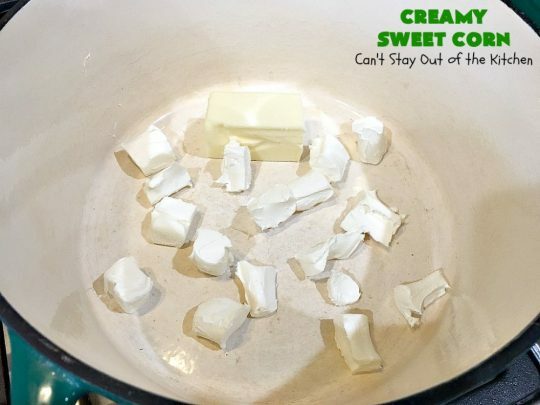 Place a half stick butter and 4-oz. of cream cheese in a large Dutch oven. Heat over low to medium heat. Melt the butter and cream cheese. Stir with a whisk frequently. 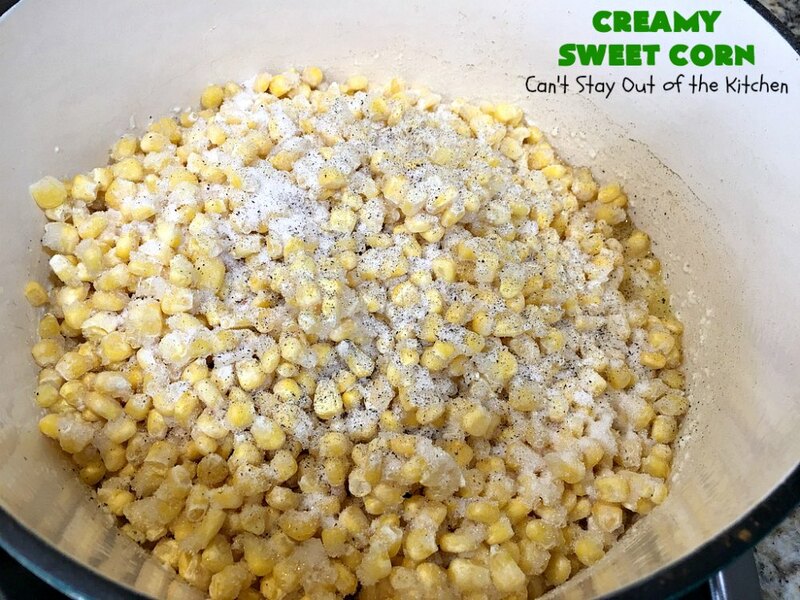 Add thawed corn, sugar and salt and pepper to taste. Stir frequently so ingredients blend together. After about 8-10 minutes the corn has heated thoroughly and the ingredients are a lot smoother. Add heavy whipping cream (or half-and-half if that’s all you have). Stir to combine and heat thoroughly. (This won’t take long). Once the cream has heated through, you’re ready to serve! 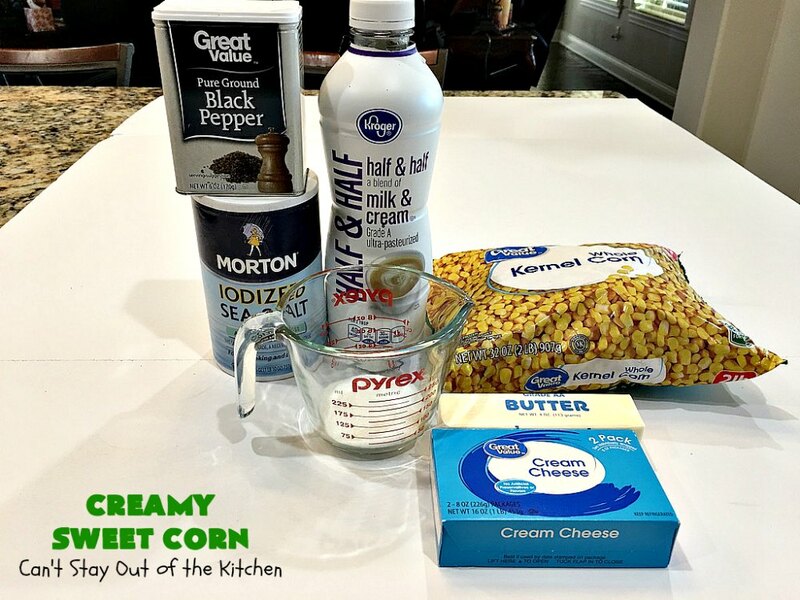 This sweet corn recipe tastes a lot like Rudy’s BBQ Cream Corn. 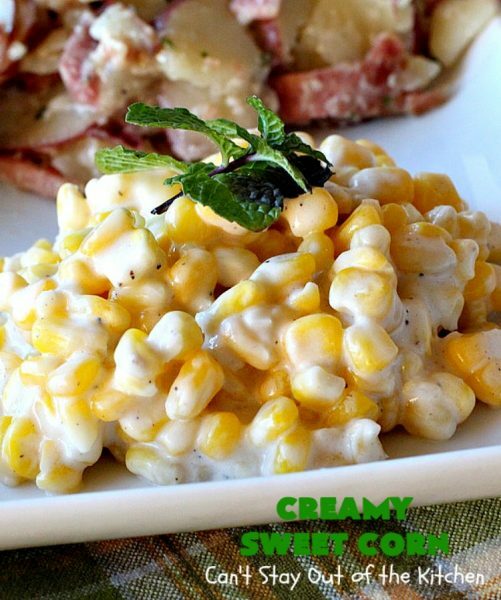 I served Creamy Sweet Corn with Creamy Scalloped Potatoes and Ham. That was one fantastic comfort food meal! Creamy Sweet Corn is so quick and easy. It’s the perfect side dish for company, holidays or even regular family meals. 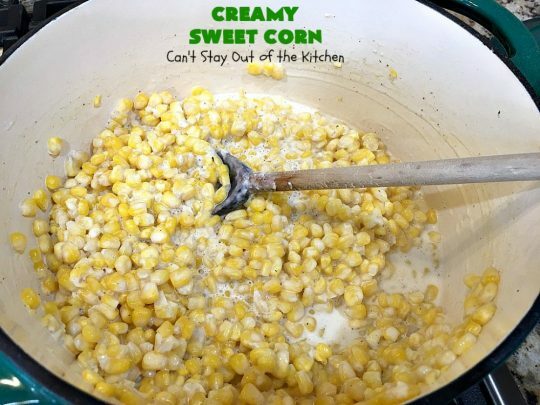 Creamy Sweet Corn is absolutely sensational. This quick and easy side dish can be ready in about 10 minutes. It's perfect for company, holiday or family dinners. This recipe tastes a lot like Rudy's BBQ Cream Corn. 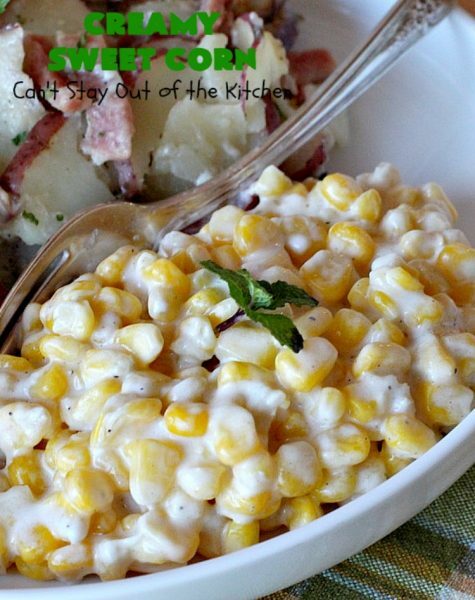 It is so delicious you'll find this corn recipe becomes your favorite go-to side dish. Gluten free. Add the corn, sugar, salt and pepper. Stir frequently so all the ingredients blend well together. Cook over low heat until corn is hot. Add the whipping cream and stir thoroughly. NOTE: I have used either half-and-half or heavy whipping cream. My personal preference is heavy whipping cream. NOTE: This will take longer to cook if the corn is not thawed. 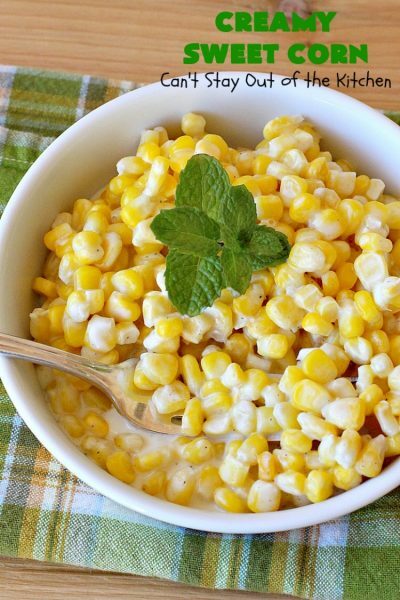 Seriously, you’ll be drooling over every bite of this scrumptious sweet corn. 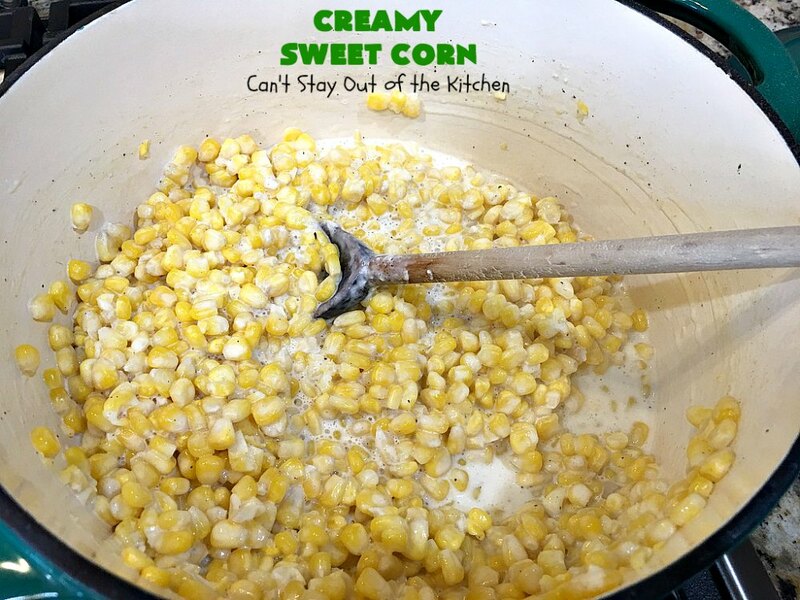 Creamy Sweet Corn is gluten free for those with gluten intolerance. 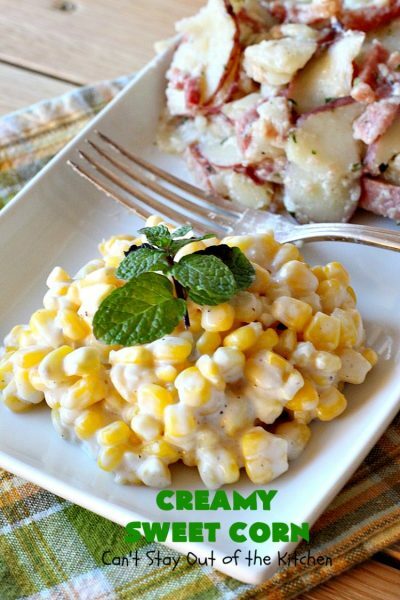 Creamy Sweet Corn teams up really well with Creamy Scalloped Potatoes and Ham. wow you have bunch of pics to show how to make these creamy sweet corn so hard working and dedicated! great recipe for having a healthier breakfast! Hi, Mary. Well I’ve never thought of making this corn for breakfast before, but it sure is one of our favorites. We love this stuff for dinner.